Jonathan Bergeron: When I agreed to do it and used older paintings I did as a start up. I did something for Eddie Wall pro model for Forum snowboards a while back, which was base of an older painting I did when I started doing the Calaveras. 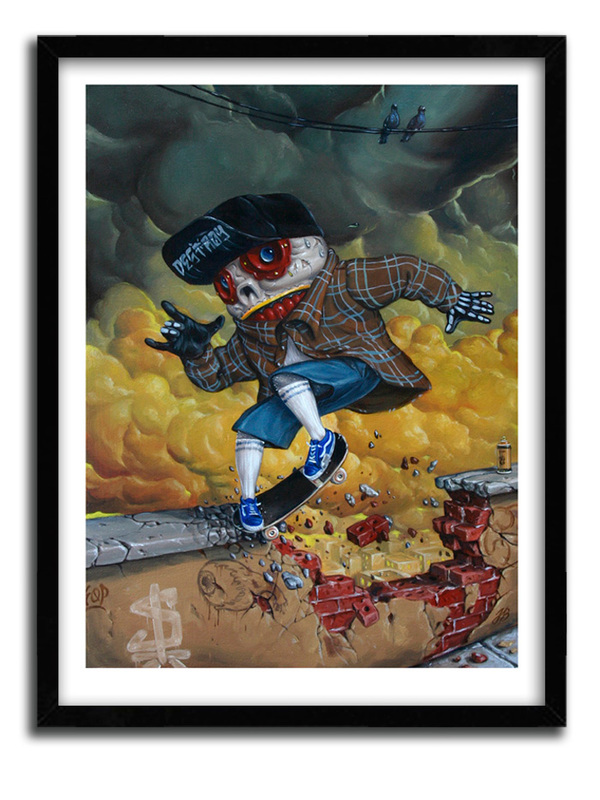 It was a cool “Homie” calavera sitting on a wall, Homie Dumpty to be exact. I just made him do a grind an a shattering wall. 1xRun: How did the idea and execution come together? Jonathan Bergeron: This piece was created in 2011, with Oil on wood. It was a commission from a friend. She wanted to give a painting of mine to her boyfriend. I agreed to do it and used older paintings I did as a start up. I did something for Eddie Wall pro model for Forum snowboards a while back, which was base of an older painting I did when I started doing the Calaveras. 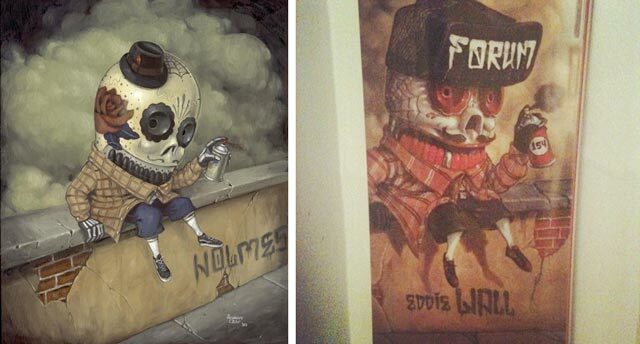 It was a cool “Homie” calavera sitting on a wall, Homie Dumpty to be exact. I just made him do a grind and a shattering wall. 1xRun: How long did the piece take to create? Jonathan Bergeron: About two days. Jonathan Bergeron: I like the color scheme and movement. Plus, I added that eyeball that the owner likes to paint all the time. Jonathan Bergeron: Because it’s awesome. 1xRun: You have been making a ton of new work lately, can you clue people into some of your recent favorites that you’ve created? Jonathan Bergeron: I just had a solo show at Yves Laroche gallery in Montreal, my hometown, and I did a bunch of post apocalyptic sorta landscapes that I had a blast working on. 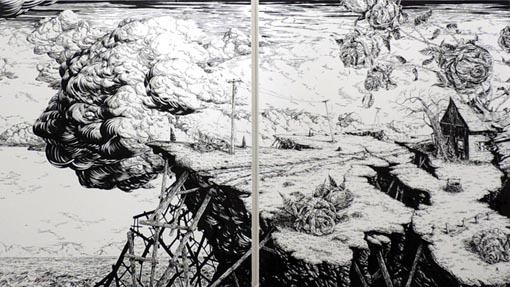 My favorite was “The Road”, a 11 x 6 feet big, ink on canvas diptych in about 30 hours. I love that piece. I can’t wait to make another big one. 1xRun: What do you have coming up in the next few months? 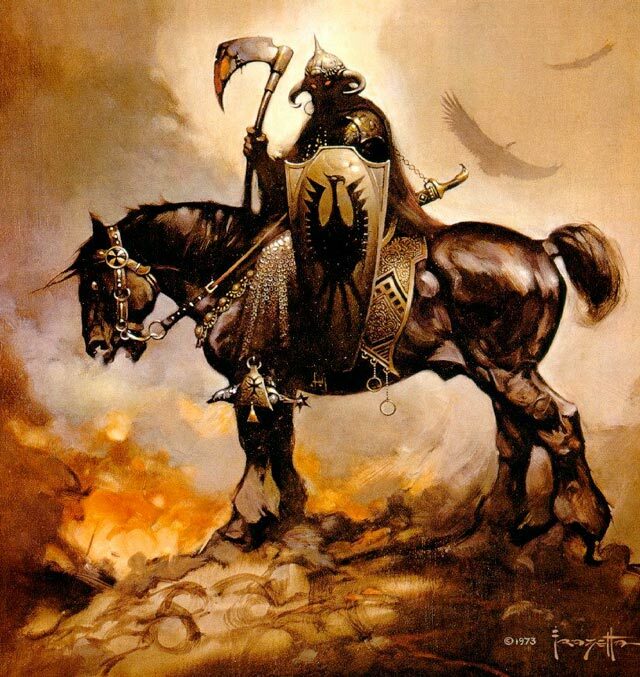 (Above) Johnny Crap Death Dealer Work In Progress – Below Frank Frazetta’s Death Dealer 1xRun: Where else can people find you?